Evaporation is a common method of thin-film deposition. The source material is evaporated in a vacuum. The vacuum allows vapor particles to travel directly to the target object (substrate), where they condense back to a solid state. HEXON offers a comprehensive selection of evaporation sources for your thin film coating and metalizing demands. 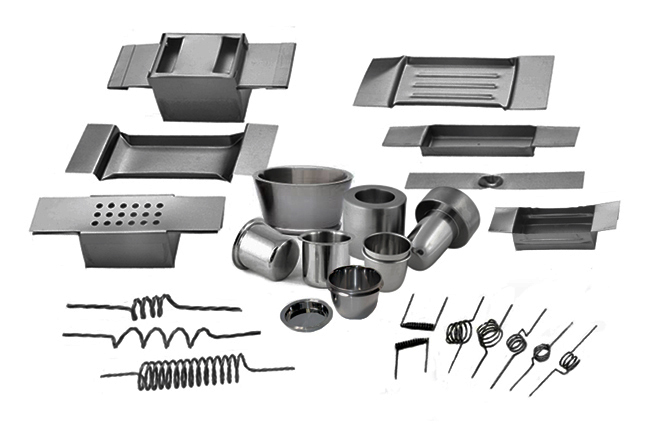 Our evaporation sources are fabricated from refractory metals such as tungsten, molybdenum, tantalum, niobium and zirconium. We can offer the standard size, as well as custom design to meet your specific needs according to drawings. All of our evaporation sources are available in high purity and possess longer heating life. No matter demanding for R&D or industrial, you can find the suitable evaporation sources in HEXON. Filaments offer ease of use, low power requirements, large coverage areas and low cost, and crucibles can offer larger capacities, easy loading and improved directional vapor patterns.Evaporation boat sources are ideal solutions to many thin film coating processes and its capacity is available in an extensive range, flexible to modify by tools, just manufacturing to fit to your individual need.